The Arizona Cardinals, by all accounts, seem likely to take Kyler Murray first overall. The Oakland Raiders have called Derek Carr a franchise quarterback. Even if the Raiders loved Murray, they can’t do much about it at the fourth overall pick. So why are the Raiders going to Dallas to work out Murray on Monday? SI.com’s Albert Breer said the Raiders are holding a private workout with Murray. Then they’ll go work out Ohio State quarterback Dwayne Haskins. The Haskins part is interesting too, but more conventional. Haskins could be available at No. 4. The Raiders want to be prepared for that possibility. Makes sense. But what to make of the Murray workout? 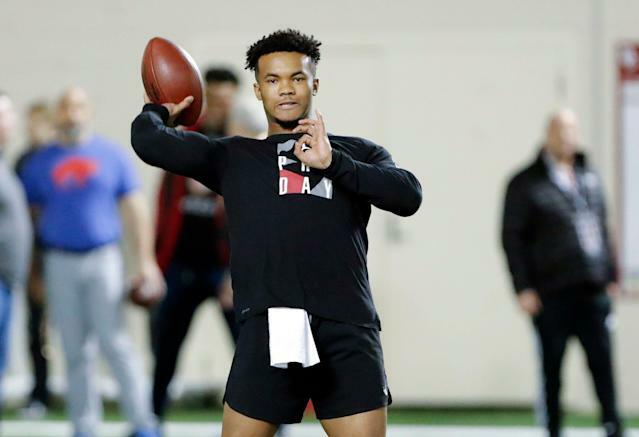 Why are the Raiders working out Kyler Murray? There are a lot of theories about what the Cardinals will do, whether they’ll trade Josh Rosen, and whether all of the Murray leaks are just an elaborate ruse to set up a trade (Yahoo Sports’ Charles Robinson broke down all the scenarios, including the interesting question about whether Rosen is at the start of the Cardinals’ offseason program on April 8). But whatever happens the most likely scenario seems to be Murray going No. 1, to someone. If the Cardinals are setting up a trade — and if they are, the smoke signals they’ve sent about their interest in Murray have been masterful — the Raiders are a clear candidate to move up, despite their public support of Carr. Working out Murray, and Haskins too, shows that maybe they aren’t sold on Carr after all. Or, they’re just making sure they have all available information on the most important position in the sport, even if they don’t have a real shot at Murray. Usually there are too many dots connected when teams visit or work out draft prospects. Just because a team visits with a player doesn’t mean they’ll draft them. But the Raiders working out Murray is a little more interesting than most. Maybe all the speculation is much ado about nothing. It could be that the Cardinals were smitten with Murray from the jump, didn’t do a great job hiding it (there’s no harm in that, considering they have the first pick) and they’ll take Murray and get what they can for Rosen in a trade. But the Raiders at least want to take a look at Murray. Presumably just in case the Cardinals are open to a trade, or in the incredibly unlikely scenario of Murray slipping to No. 4. Or for whatever other reason they have for spending some time with him in Dallas. Not every workout by a team means something. But this one will lead to plenty of tea leaves being read, as the intrigue surrounding the first pick of the draft increases.